Posted on August 3, 2014 by Ching under Leadership. I have some really exciting news to share with everyone. I get to cross another item off my bucket list. 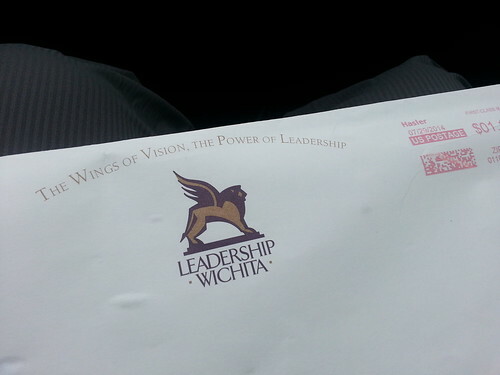 I received my acceptance letter for Leadership Wichita 2014 a few days ago. I didn’t want to say anything before because I didn’t want to be embarrassed in case I wasn’t chosen. LOL. This is something that I’ve always wanted to do, though. Getting the “big” envelope was pretty exciting. It felt like I was applying for college. Actually, I take that back. It wasn’t like I applied at Harvard. Pretty much anyone can attend Wichita State. It was a lot like applying for grad school though, where I actually had to take an exam, submit an essay, and provide two letters of recommendation. But then I scored high enough on my GMAT that I wasn’t really concerned. With Leadership Wichita I didn’t even know where to begin. The program isn’t something that I could simply apply for. I had to be nominated. And, I wasn’t even sure how that would be possible because the nomination form is very specific about who to nominate. You couldn’t nominate just anyone. Leadership Wichita is something that I’d always wanted to do but I couldn’t even tell anyone because I was afraid they’d just laugh at me. So when Ginger and Don both approached me this year about representing our company in this year’s class, I was super excited. It felt like Christmas! It’s a huge commitment so they wanted me to think seriously about it. I didn’t have to think about it, though. This is something that I’ve always wanted to do so I knew that I would clear my schedule for the rest of the year if I had to. I had secured my nomination. There was no way I was passing on this opportunity. I needed three strong letters of recommendation so I told Jim Ludwig right away. 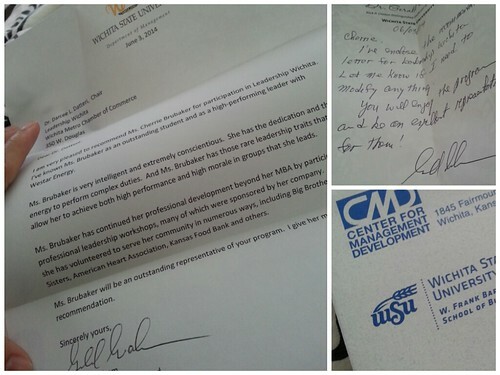 As my mentor, I figured that he would be supportive and write a letter of recommendation on my behalf. I had one letter of recommendation down and needed two more. I couldn’t ask a friend or relative because I wanted to submit a strong application. I didn’t want to be accepted simply because I’m representing my work. I wanted to be accepted on my own merit. I wanted to be a strong candidate worthy of Don Sherman’s nomination. Dr. Gerald Graham was one of my professors in grad school and a well respected leader in the community. I knew that a letter of recommendation from him would carry a lot of weight. However, I wasn’t sure if he’d remember me. His class, Organizational Behavior (MGMT 862) was one of the first classes I’d taken in grad school so it had been almost ten years. Lucky for me, I’d received additional training from Dr. Graham through work over the years so we would see each other occasionally. Despite that, I still worried that he would say no and I didn’t have a contingency plan in place. What a relief when he said yes! I was so thrilled when his letter of recommendation arrived in the mail. I knew that with Don, Jim, and Dr. Graham in my corner I had a pretty good shot at being accepted but I didn’t want to leave anything to chance. I had my work experience and educational background covered, so I needed a letter of recommendation that shows my commitment to the community. I wanted to be a solid, well rounded candidate so I asked Natalie if the Treehouse could write a letter on my behalf since I helped with Labor Run 2013. I figured that this would show my community involvement. I felt like I submitted a strong application. Don tells me that my package is great and he knows his stuff so that made me feel pretty darn good. I’m very grateful to everyone who helped me get in because I don’t think I could have done it on my own (though I probably would have kept trying). This year’s program/schedule looks really interesting. I’m looking forward to getting started and representing my company well. I promise to make the most of this opportunity and make you all proud!